A picture – and a woman in the picture is black and white. The picture is simple and carefully considered. And with intended strokes it forms a woman’s life, or some indications of life. The woman is dressed in a black. She dances solo dance in empty space. Actually, there is no space. Only emptiness, which the female body cuts. Space is converting. It can be black, gray or white. At the central point, there’s a woman and her movement. 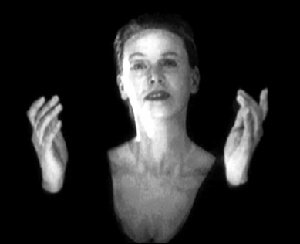 She dances calmly and deliberately, measuring her movements and gestures – and memories that dancing brings into her mind. She is no longer a young ballerina. The woman is dancing full of energy and joy of dance. At the same time memories and nostalgia of past dances are curiously mixing with her dance. Occasionally, the woman looks at her own dance. Her other half is watching and reminiscing while the other half continues to dance. Occasionally, she turns into a negative picture. But all the same, she fills the picture, and form new pictures, from where the viewer can discern her story – or his/her own story. Dance with nine cycles: gaze directions, transformation, the body remembers, forever a dancer, splitting up, serenity, new beginnings, intermezzo, balance.